Despite being more than a hundred years old, INNDIGO undoubtedly has an eye on the future. With its eye-catching, bold façade, the building presents a fascinating fusion of modern exterior and classic interior. The building was comprehensively renovated in 2014, including a complete overhaul of the façades, stairwells and balconies, and is situated around a tranquil landscaped inner courtyard. This spacious, sunny rooftop apartment is truly something special. Generously proportioned and well laid-out across 100sqm, the apartment enjoys the wooden floors and high ceilings typical to these older buildings. At the same time, its location at the top of the building means it receives a lot of light, and the spacious sun-terrace in the corner means you are always perfectly situated to make the most of the sun. 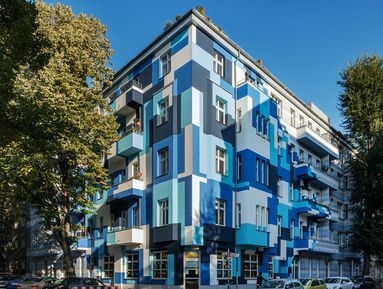 The apartment is located in Neukölln’s Weserkiez, one of the most colourful, interesting and popular neighbourhoods in Berlin. Weserstraße, the street from which the neighbourhood takes its name, is the lifeline of the area, and famous throughout the city for its vibrant atmosphere and array of bars, restaurants, and shops.